Gaboon Protection is a specialist Close Protection company with an impeccable and extensive track record. Based in Cape Town, South Africa, we are perfectly positioned to deploy our professional resources both into Africa and further afield. We provide a complete range of close protection and related services to our clients with discretion, loyalty and confidentiality. All our services are interlinked as most of our personnel have extensive training and experience in multiple disciplines and arenas. Gaboon Close Protection has an impressive ability to provide a substantial, highly trained team of skilled manpower where and when needed. Our services include Personal Protection, Protective Driving, Asset Protection, Event Risk Management & Travel Risk Management. Our Gaboon medical personnel are not bodyguards with first aid training, they are hybrid Close Protection Officers, medical professionals, with highly sought after skills. They can be utilised in a purely medical capacity or have a duel role due to their strategic capability and are familiar with working in remote areas (clinics in central DRC), in hostile environments (Iraq/Afghanistan/South Sudan etc. ), or in the corporate environment. Gaboon’s tactical unit is comprised of Close Protection Officers who have backgrounds in specialised police and military units or who have complimentary skills such as pilots. Their ability to work under pressure in extreme circumstances makes them ideal for our bespoke service. Accurate information is invaluable in both the personal and corporate environments. Our Intelligence division employs individuals with experience in highly specialised law enforcement and investigative units with proven intelligence ability. We offer surveillance and counter-surveillance, due diligence reports, profiling, and corporate, commercial and criminal investigative services. A safe, secure and totally bespoke African destination management service. This service is specifically positioned for the individual traveller who would rather travel discretely, or in smaller groups. Travel with a multi-skilled professional, or have us prepare an appropriate, risk-assessed itinerary. We make travel dreams come true – safely. Do you need specialist close protection for an individual, company or organisation? Gaboon Protection has gained a reputation for being a leading close protection service provider. We believe that the success that we have experienced has come through our philosophy of maintaining a strong sense of loyalty within our close-knit team, which extends to our client relationship. The well being of each individual within our team is of paramount importance as we recognise that a healthy state of mind is vital for us to constantly deliver the high level of service for which we are known. Gaboon Protection was established in 2010. The founders have extensive operational experience within the industry and determined to provide the security industry with a specialised, professional close protection service operating at the highest level. 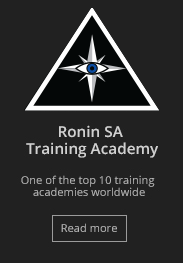 Our team is made up primarily of Ronin SA graduates, ensuring that all operatives are highly skilled and competent within the close protection field.